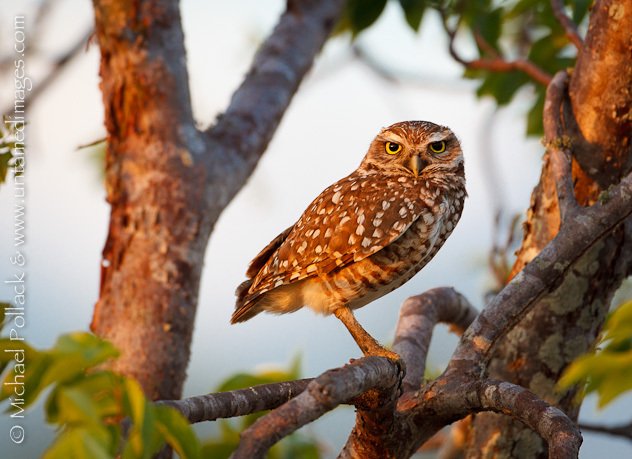 A burrowing owl (Athene cunicularia) perches in a tree to better survey the area surrounding its burrow. I don’t know precisely what it is, but I sure do have a soft spot for owls. This beautiful burrowing owl was photographed on a recent trip to Florida where I spent eight days in the field with my pal Judylynn Malloch. Judylynn was kind enough to take me to one of her favorite locations in Broward County where burrowing owls have nested in prior years. We spent a very productive afternoon photographing multiple owls, but as daylight began to run short, Judylynn suggested we concentrate on a burrow near a small tree with relatively sparse foliage. She predicted that as sunset approached we might see the owl fly up and perch in the tree.